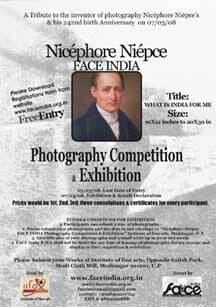 FACE India organized a Photography competition and exhibition, Nicéphore Niépce FACE INDIA photography competition and Exhibition, at Institute of Fine Arts, Opposite Satish Park, Modi Cloth Mill, Modinagar 201201, U.P on 7th March 2008 to 10th March 2008 .I ts 242nd birth anniversary of Nicéphore Niépce, who was the inventor of photography to this world. Joseph Niépce was born on 7 March 1765 in Chalon-sur-saone, France. He created the first permanent photograph. At the Heart of their Art, Understanding Children Through Their Creativity, dreams are the first purposeful marks left by children. Dreams are the building blocks of children's art. 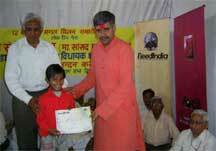 Every child is an inborn artist. Activities such as drawing, painting, and sculpting are a part of human nature, and every human being experiences the urge to create and to communicate through their creations. FACE INDIA (Foundation for Art, Culture & Education) respects these dreams in its pursuit of promoting and helping creative individuals and dedicates this campaign to the dreams. 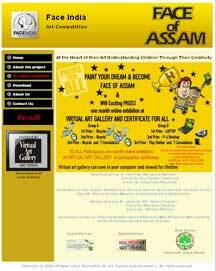 The FACE OF ASSAM is a unique art event, involving various schools in Assam to explore and recognize the talent of student’s creativity. 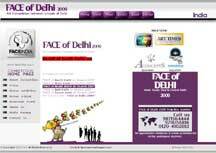 At each school level the students creative works of art will be displayed and judged by jury panel.